Every animal in this herd has a set of trophy-worthy horns and the cowboy remains a respectful distance from them! 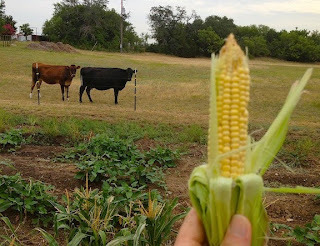 The corn was ripe and harvested last week within two days. It was so hot that anything left longer was already too starchy to eat, BUT the cows love it! I am stripping several rows every morning and picking the remaining little ears to give to Abbey and Sophie . The "welfare cows" are waiting for me as I head to the garden with my Homer bucket. I don't need to call them up. Cows are so easy to teach new routines.